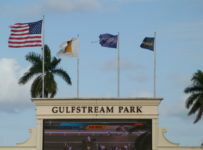 Here are details of what will be happening this week at Florida’s thoroughbred tracks, with a focus on the Rainbow 6 at Gulfstream Park. In this story, we also look at upcoming Florida stops on the Road to the Kentucky Derby. 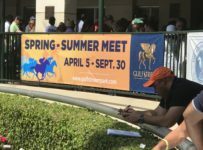 The Oldsmar track will resume racing on Wednesday with nine races and first post of 12:23 p.m.
On the second race, it will have a carryover of $2,668 on the Super Hi-5. That race has eight entrants and likely will have at least seven starters, the minimum required to have the SuperHi-5. The first race has just six entrants. Tampa Bay will have its usual live schedule of Wednesday, Friday, Saturday and Sunday. Meanwhile, the buzz will intensify about Tampa Bay’s annual Festival Day to be held March 10. 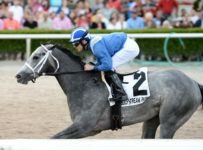 There will be five stakes races, including the Tampa Bay Derby (Grade 2) at 1 1/16 miles for 3-year-olds. Flameaway, winner of the 1 1/16 mile Sam F. Davis (Grade 3) at Tampa Bay on Feb. 10, is expected to run along with Vino Rosso and Hollywood Star. Those two horses finished third and fourth, respectively, in the Sam F. Davis. 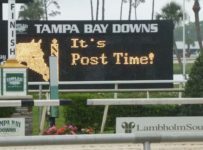 At the end of this story we will have details on how the Tampa Bay Derby and the Fountain of Youth, to be run at Gulfstream Park on March 3, fit into the Road to the Kentucky Derby point scoring race. The Kentucky Derby (Grade 1) will be run May 5 at Churchill Downs in Louisville, Ky. 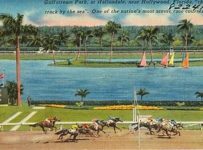 The Hallandale Beach track will have ten races on Wednesday with first post of 12:35 p.m.
On the first race, there is a Super Hi-5 carryover of $5,976. 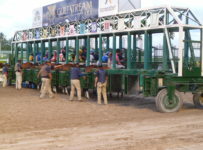 The carryover on the Rainbow 6 has grown to $1,778,601. 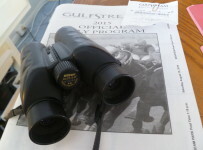 It will be on Wednesday’s fifth through tenth races, with the sequence scheduled to start at 2:35 p.m.
That will follow Sunday, when there were 197 tickets with the winners of all six Rainbow 6 races. Each received $1,638.34 on the 20-cent only bet under Gulfstream’s rules on multi winner days (details below). The carryover is into its 21st day. That is the number of race days on which there has not been the jackpot payoff requirement of just one ticket with the winners of all six Rainbow 6 races. The jackpot consists of the entire carryover plus 80 percent of the day’s Rainbow 6 bet. 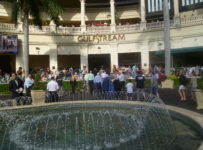 On days with multiple tickets that have all six winners, Gulfstream takes out 20 percent. It then divides 56 percent of the day’s pool among winning tickets and ads 24 percent to the carryover. This Rainbow 6 carryover has been growing faster than any previous carryover during the period since February 2016, when HorseRacingFLA began using Equibase charts to track Gulfstream handle. 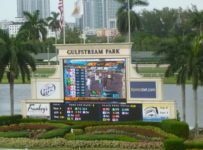 Betting on the Rainbow 6 is among reasons why Gulfstream is on path to break its single meet record for daily all-sources handle of $10.1 million–set in the 2016-2017 championship meet. 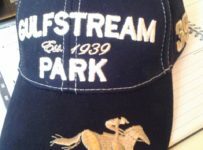 Through this past Sunday Feb. 25, Gulfstream has averaged just under $10.1 million in daily all—sources handle according to HorseracingFLA’s review of Equibase charts. That average was just under $9.5 million for the comparable period in last season’s championship meet. 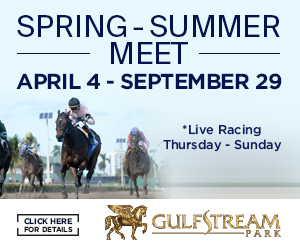 Gulfstream is coming up on one of its traditionally strongest parts of the championship meet, including the Florida Derby closing weekend. Thus, daily average handle of $10.5 million appears within reach. 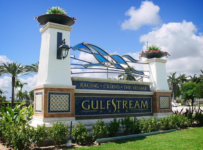 Gulfstream on Wednesday will draw and announce entries for the $400,000 Fountain of Youth (Grade 2) and the seven other stakes races it will run this Saturday March 3. It is widely expected that the Fountain of Youth will be headed by Good Magic, the winner of last year’s 1 1/16 mile Breeders’ Cup Juvenile (Grade 1). The Fountain of Youth would be the first race for Good Magic, trained by Chad Brown, since the Breeders’ Cup race on Nov. 4 at Del Mar. Audible, trained by Todd Pletcher, won the 1 1/16 mile Holy Bull (Grade 2) at Gulfstream on March 3, and is expected back for the Fountain of Youth. Free Drop Billy, Catholic Cowboy and Enticed are among other possible entrants in the Fountain of Youth. 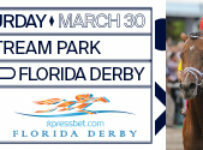 The Sam F. Davis and Holy Bull were first round races in the “Road to the Kentucky Derby” points system for earning a spot in the Kentucky Derby. The first through fourth place finishers received ten, four, two and one points respectively. 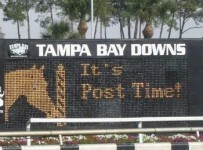 The Fountain of Youth and Tampa Bay Derby are second round races, with qualifying points awarded on a 50-20-10-5 basis. 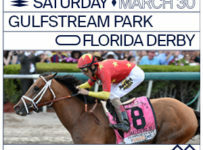 Gulfstream will have the $1 million Florida Derby (Grade 1) on March 31. It is a final round qualifying race for the Kentucky Derby, with points awarded on a 100-40-20-10 basis. A maximum of 20 horses can start in the Kentucky Derby. One spot is held for a horse that earns the most points in “Japan Road to the Kentucky Derby” races, and one spot is held for a horse that earns the most points in “Europe Road to the Kentucky Derby” races. Last year was the first year with Japan Road races, and no horses from that series were entered in the Kentucky Derby. This is the first year for the Europe Road to the Kentucky Derby. Churchill Downs will draw entries for the Kentucky Derby on Tuesday May 1. In addition to the 20 horses that make the field, there can be as many as four also eligibles. An AE horse can get into the race if one of the 20 horses is scratched before 9:00 a.m. Eastern on Friday May 4. Churchill Downs introduced the current points system in 2013. In some of those years, owners of one or more horses with sufficient qualifying points chose to not enter them in the Kentucky Derby.